Last week, I talked about how well the bathroom organization under my sink was working after a year of use. I also mentioned that I hadn’t conquered keeping the bathroom counter clear from everything yet. Well, I may have figured out the solution! I’ve been intending to tackle my husband’s side of the bathroom for awhile now. It always taunted me knowing there was a mess under his sink, but at the same time, I always pushed it to the bottom of the list because I rarely opened the doors. Now that it’s done, the bathroom feels so much happier. Here’s how I fixed the mess in 5 easy steps that you can use to conquer your own organizational challenges. This is a VITAL step we’ve all tried to skip over to save time. Before you even shop for bins, every single thing needs to come out of the cabinet and be sorted. This is a great time to send stuff to the trash and donation or garage sale pile. Group like-items together and start to think about what kind of containers would work for them. Would anything make more sense in a different cabinet? Do you need to add anything that is currently stored elsewhere? 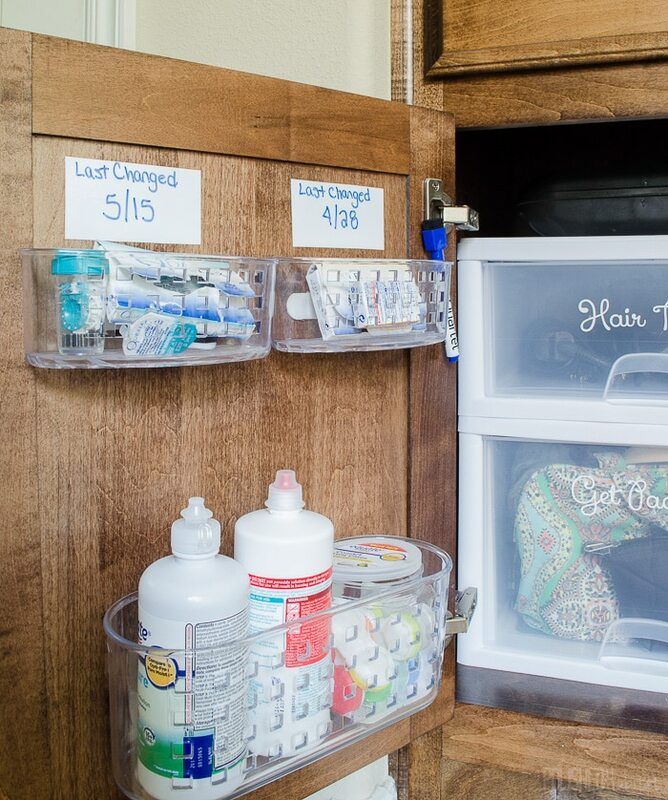 For us, contact-related supplies are often left out on the counter because the solution goes in the linen closet and the cases go in a drawer. Instead of putting them away, they just get left out. I decided to put them both in this cabinet, even though they weren’t here before. More on that later! I also knew I needed bins for toiletry bags, cleaning supplies, and hair tools (curling iron, crimper for 80’s parties, etc). 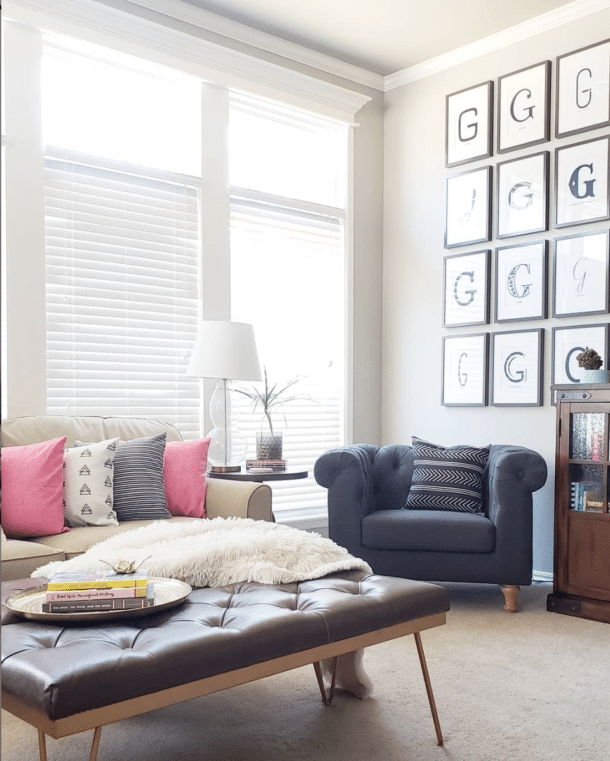 Grab a tape measure and some paper to sketch out your space. This may seem a little silly, but you wouldn’t believe how helpful it is when you are shopping for the best containers for the job. 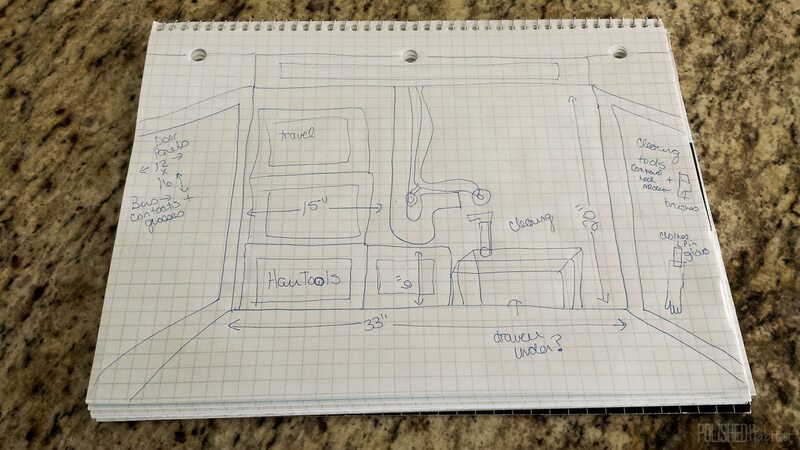 If you are working on an under the sink cabinet, make sure to include the measurements around the plumbing. This saved me so much time at the store! The first set of drawers I wanted, I realized were two inches too tall. Then I picked out a drawer for under the P-trap and it was 1/2″ too tall. Eyeballing it, I would have sworn both would fit! I made sure to roughly plan space for each grouping of items, which was so helpful when shopping for containers. Don’t forget to use the space on the back of the doors! I was completing this project somewhat impulsively, so took my drawing to Walmart and tracked down items that would work. Normally, I’d plan ahead and find the perfect items on Amazon. Finally, the fun part! 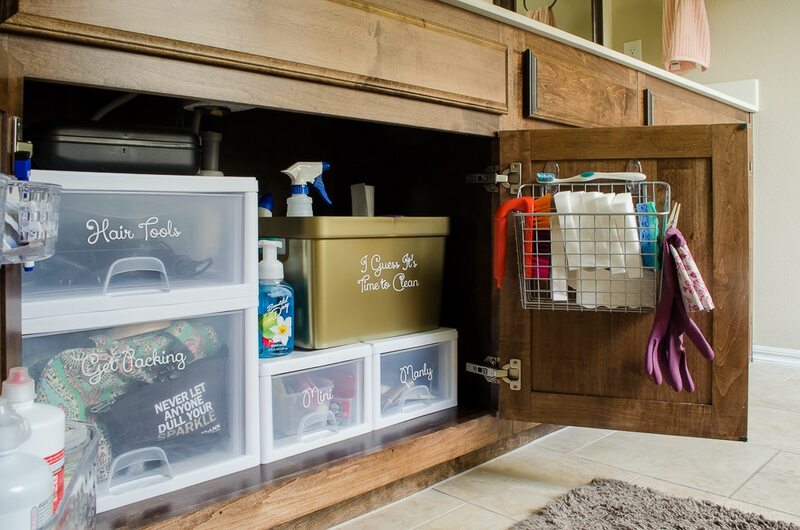 Get all your new bins loaded into the cabinet and fill them up. To keep things organized long term, make sure you add labels. I mentioned needing a home for our all contact supplies, and this is my favorite part of the bathroom now! We each have a bin for extra contacts and our current case up top, along with a piece of dry erase vinyl to help us keep track of when our monthly contacts need to be replaced. Dry Erase Tape would work great too! Below that, I used a larger bin for the solution and extra cases. The contact bins came with suction cups for the shower, which I removed and instead attached them with Command Picture Hanging Strips. I used one strip on the small bins and two on the larger size. On the other door, I found a basket designed to hang over the door. I wanted something to hold the cleaning tools and this was perfect! Instead of using the over the door hooks that came with the basket, I opted for clear command hooks. The included hooks would have shown on the outside of the door and I didn’t want that. A simple clothes pin works to attach my gloves to the basket and keep them handy. Drawers are my favorite and I managed to fit FOUR in under the sink! Remember my drawing with all the measurements? You can totally see where it pays off here. I was able to come up with a combo of drawers that fits perfectly around the plumbing. Hooray! I started with the tall drawer we needed for travel toiletry and jewelry bags, then added a shorter drawer on top that had to have been designed just to corral hair tools. It’s perfect for them! Under the plumbing, I used a smaller size for all our travel toiletries. Anytime we get sample size items, they go here. Next to that, my husband got a drawer. I mean, it is his side of the vanity, so he deserves a little space, right? I had a gold tub leftover from the closet makeover, which fit right on top to hide the cleaning products. Ah, so much better than before! Now that everything has a home, we should be able to KEEP the counter clear all the time! Lots of studies talk about the impact of clutter on your mood, and I’m convinced that even hidden clutter is an issue. Which is a problem for me, because I have a lot of it! I’m so glad to get this cabinet checked off the list. Now it’s time for a bubble bath before I move on to the next project! 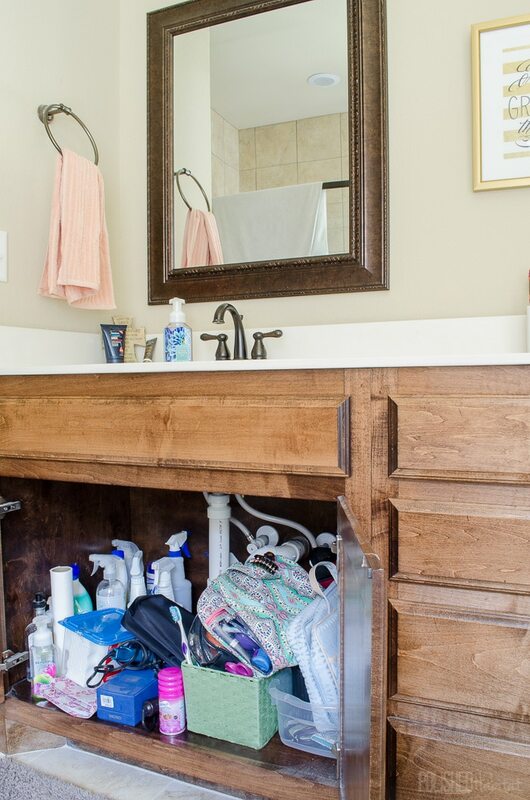 Now that things are tidy under the sink, it’s time to see how to organize the bathroom counter! 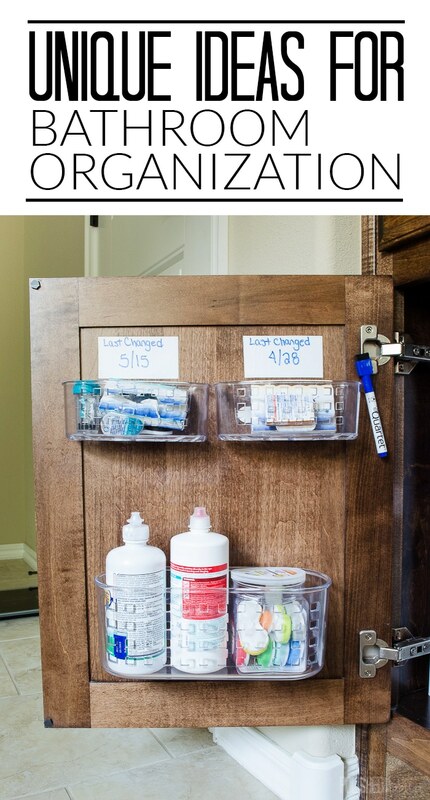 You can also find more cabinet organization ideas in my kitchen organizing post! « Modern Ceiling Fans – Stylish Fans DO Exist! Lots of great tips in here, but the hidden gems are the labels! They are cracking me up! Especially “I guess it’s time to clean”! Super helpful post–especially things like swtiching out the over the door hook for command hooks–such a simple fix that makes a big difference in the aesthetic. Glad to see I’m not the only one who keeps old toothbrushes for cleaning. I wrap the handle of mine in coloured tape to make sure they don’t get mixed up with the proper ones. That’s an awesome idea, Mary! 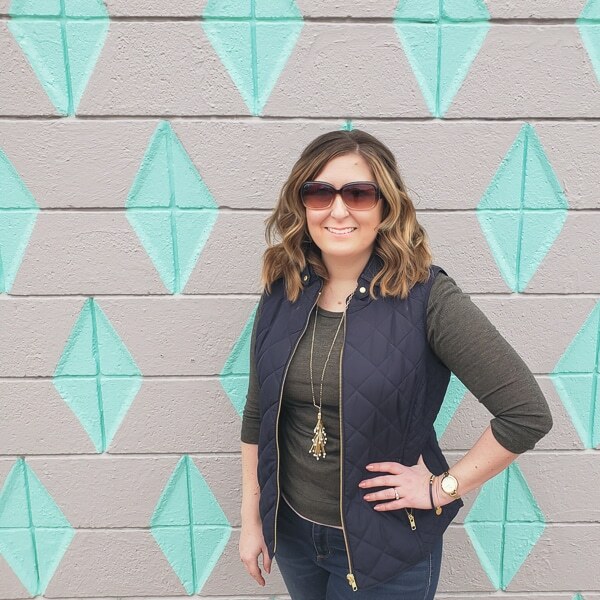 I loved your organization ideas! Got to get to work on my make up, hair stuff, and female goodies! It will be nice to be able to grab what I need instead of pilfering through a mass of confusion. I love the gold Amazing Grace framed. Do you have a DIY on that piece? Thank you Beth! The Amazing Grace is even easier than a DIY. It came from Hobby Lobby and last I saw they still carry them. They are 50% pretty much every other week and with that sale I think they end up being $12. Can’t beat that for framed art! Thank you so much! Love your skills! 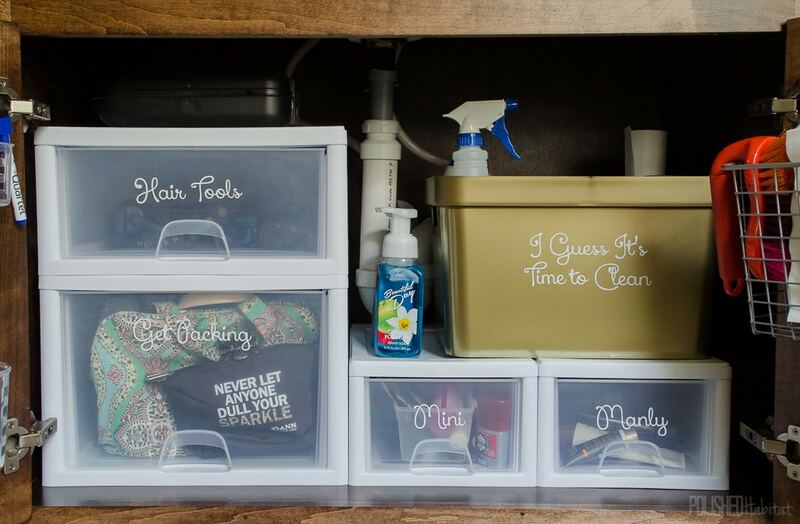 How did you label your bins? I would love to do the same thing. Hi Heather, I cut the words out of vinyl on my Silhouette machine to make the labels. You could also use a pretty font printed out on a clear shipping label for an easy option. Looks great! Thanks for the inspiration. 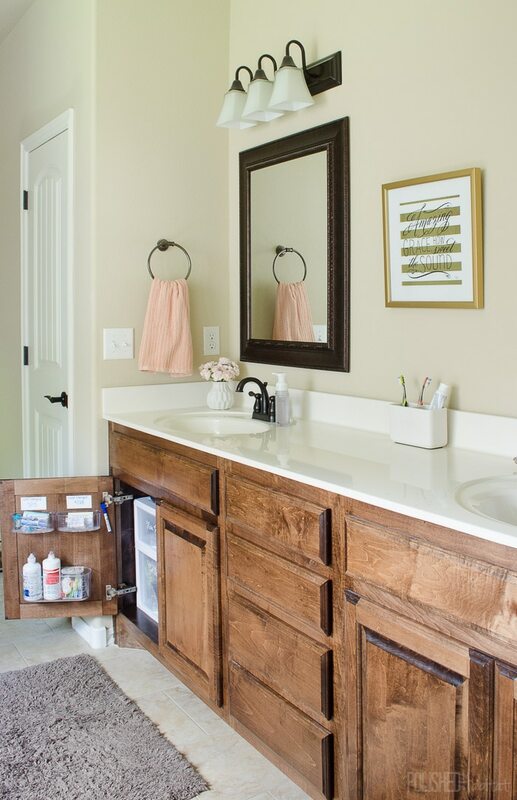 Where did you buy the “drawers” that are under the sink? Thanks, Jess! I got them in a Target store. I have some of them in the lower kitchen cabinets also. They’re great! I’ve been reading your posts on pinterest. Love all the under the sink organisation. I have a question. 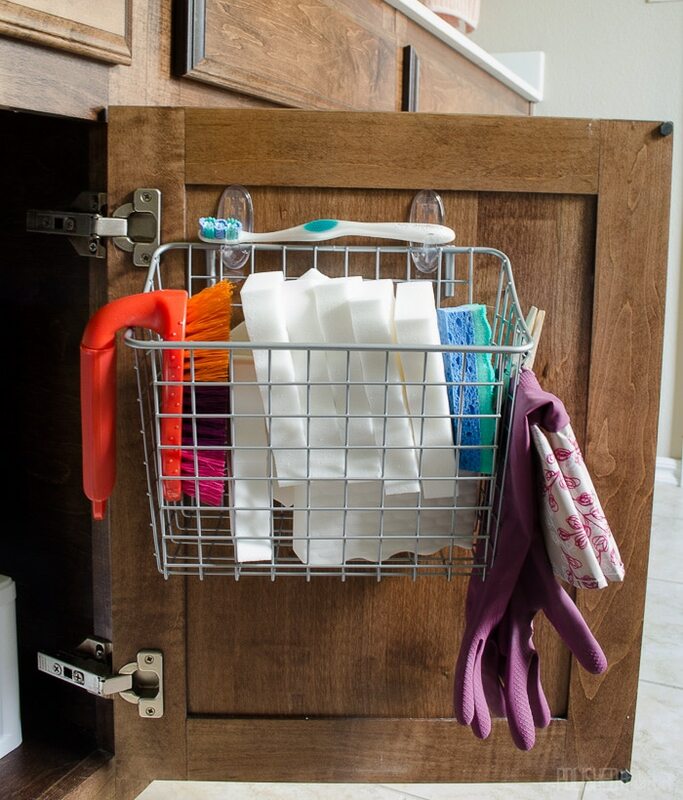 How long does the command hook tape last to hold up your bins and baskets? I have used these before and never have much luck keeping them attached. They tend to give way after awhile and leave nasty sticky marks. Do you prep the area where the sticky tape attaches before hand? Hi Vanessa, They definitely last longer if you prep the area with rubbing alcohol and let it dry. The only place I’ve had issues with them falling off quickly has been on my front door, which I think is because of the temperature swings. In the bathroom, they’ve all lasted over a year, even with regular use on the swinging door. My contact container did give out, but it didn’t leave a residue and lasted long enough that I reinstalled it the same way. It’s crazy yours are leaving sticky marks though! I think I’ve only had that happen once and it was the clear kind on glass. Goo Gone is awesome if you haven’t tried it, I just had to use it to get rid of stickers on the bottom of bowls that wouldn’t come off despite going through the dishwasher several times. Great inspiration. I am wondering if there is room to slide the bottom drawer out or if the door hinges are in the way? I have a similar cabinet that I want to organize. Hi Pam, In our cabinet, the drawers slide out well around the hinges. Depending on your hinges, you may have to cheat the drawer over 1/2″ to make sure it has enough clearance. Thanks!